..and I don't mean smashing music on the floor. The nature of this rambling story begins with a boy. All the way here! - On The Other Side Of Tummy Mountain! He is very small but obviously very clever to have worked out how to get here. Being very clever he told us that the tallest thing in the world is a giraffe. Wee Small disagreed and said the tallest thing in the world is a house. Wee Golden, being very clever, didn't miss a beat when he revised his first statement and told us that the tallest thing in the world is a giraffe on the roof of a house. 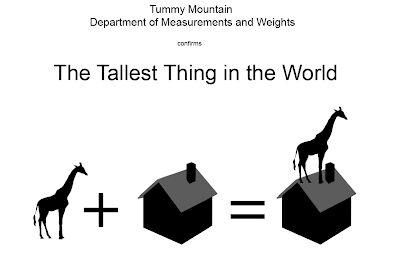 At this point the Tummy Mountain Department of Measurements and Weights intervened, in the interests of scientific accuracy, to present this graph in the form of an equation, ensuring that there cannot be any confusion as to what is the Tallest Thing in the World. The evidence is pretty compelling. Neither the giraffe or the house can quite claim the record, but when combined it is incontrovertible. Government agencies from across the globe have contacted the little ones to update their data. This is sure to get an entry in "The Tummy Book of Records" right after Wee Tiny's sensational "Most Butterflies Chased Across A Garden In a Ten Minute Period." I like your graphic equation. It makes things very clear - which is quite important when you are a Big Person, who is not quite as clever as Wee Golden. we strive for accuracy on tummy mountain - no outlandish tales and exagerations around here!